The Month of Festivals: Visiting India in July? Don’t miss these 7 festivals! Thinking about booking flights to India but not sure when to go? We have put together a list of 7 festivals that are well worth planning your holiday around. Kumbh Mela is the religious pilgrimage to the Ganges River to commemorate the war over the holy pitcher that contains the ‘nectar of immortality’  This festival is something you will not forget. Between 50-110 million people make the pilgrimage to Kumbh Mela. In the daytime you can experience riveting lectures from gurus, witness naked ascetics performing mriacles, Brahmins working on blessings and marching bands that seem to appear from no where. Whilst at night you can witness spectacular theatrical performances about the great Hindu myths. You can buy inexpensive but beautiful Indian works of art including fabrics, jewellery and other trinkets. The whole experience is often referred to as profound, which is of course what you would want. 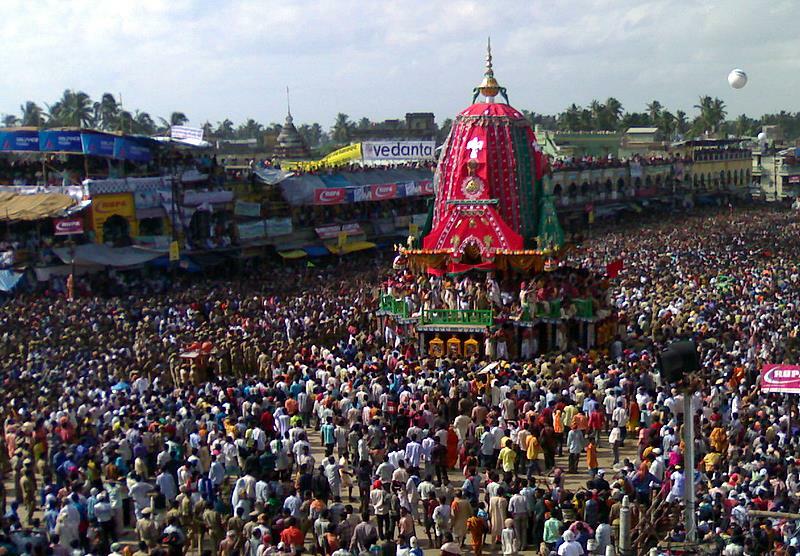 In honour of the Hindu God Jagannath, his brother Balabhaadra and sister Subhadra are carried in three large colourful raths in a parade, which goes to Jagannaths garden palace. The reason for the festival is not necessarily know but it is said that it is to celebrate Krishnas return from exile. The whole experience of carrying the chariots is a religious one for the thousands that participate. To those who commemorate the festival touching the holy chariots and ropes are supposed to bring the same amount of fortune as athousand horse sacrifices. The festival typically takes place during one of the rainy seasons in India so this usually falls between June and July. In the region of Kerala, the boat race season commences with the famed Champakkulam Moolam Vallam Kali boat race. Set in a beautiful, tranquil village in the Alappuzha district both locals and travellers from afar visit the banks of the river to watch the race. The more adventurous spectators tend to climb the trees close to the banks to get a better view of the race. Being the largest sporting event in the world the snake boat race is often considered as the ultimate athletic test of speed, endurance and skill and is a true wonder to witness. For the seventh year, Splash returns to Kerala. Set in the monsoon season the festival is all about nature and is a fantastic opportunity to get stuck into some outdoor activities. The carnival consists of three sports filled days of outdoor and indoor activities. This includes river rafting, mountain biking, mud football and crab catching. You will be truly blessed with the beauty of the Wayanad district. Fortunate to have many of nature’s greatest treasures such as ancient ruins, elusive mountain caves, aborigine tribes, hidden crevices, tree house, jungle trails and incredible wildlife. This festival is held over two-days and celebrates the birth of Guru Padmasambhava. During the festivities you can expect to enjoy regional traditional music with elaborately dressed performers. This memorable tribute is held in the largest Buddhist monastery in Ladakh, home to more than 600 monks. The celebration conveys true Indo-Tibetan culture, against a stunning backdrop. Experience the sound of the traditional drums, the instruments played at this festival symbolise the victory of good over evil. The inner messages portrayed by the marked prayers on historic religious paintings are more than 300 years old. The customary ‘Sangodd’ festival of Saint Peter and Paul is held in the monsoon season every year. The local village communities of Goa’s fishing circles curate this festival by tradition as an appreciation of the patron St. Peter – the saint of fishermen. Where: Goa, particularly the riverside villages of Candolim, Siolim, Ribandar and Agassaim. A newbie on the Indian festival horizon, held for the first time in 2012, this yearly celebration is one of the chief film festivals in the world. Their purpose is not only to draw attention, but to define the physical beauty of Ladakh. The idea behind this event is to celebrate pioneering films on the horizon and to address environmental and biological topics taking place too, revealing themes such as wildlife conservation. When: Dates to be announced.